Keep a part of your horse near you always, or create a keepsake of a special horse that is no longer with you. Customize your bracelet with available options to make your remembrance one of a kind. 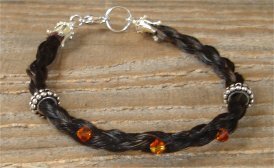 Each bracelet is handmade and unique--designs will vary slightly from those shown. HOW TO ORDER: Click the above Add to Cart button once for the basic bracelet. Use your browser's BACK button to return to this page and Click the individual Add to Cart buttons below each option that you would like to order. Note that you may have to return to this page and click Add to Cart more than once if multiple selections are desired. Ex: Enter each letter or Swarovski color selection separately in the box and click Add to Cart for EACH selection. Alternatively, enter the options you would like in the Notes box after you order the basic bracelet and I will send you a separate invoice for your options. After your order is received, directions will be sent to you for collecting horsehair for your bracelet. Payment must be made at time of order. If you do not wish to order via Paypal, please Email to make alternate payment arrangements.